I sent seven manuscripts to beta readers recently. Initially I had chosen six beta readers but added my dad to get a man's perspective. I assured them that I wanted their honest feedback, that I was ready...bring it on! Some initial feedback was good. Fear crept into my heart...what if? How would I react? All that work, wasted? I have received three of the seven manuscripts back now. It's proving to be the best part of the process of writing a novel for me. What I feared was someone saying they didn't like it. That this and that and the other thing didn't work. That this character was this way and that wasn't good enough. Translate: I didn't do a good job. Fine tune translation: Stop writing. What I learned is that I WANT to know that stuff. When I have read the critiques, my mind does not swirl with angst and upset...far from it! It swirls with ideas and inspiration! I want it to be good enough for a publisher to buy it. I'm not married to it as it is...I want it to work, so my readers will love my characters as much as I do! The overall feedback has been that it's a good story...and some have enthusiastically driven their opinion home...what a blessing! That's comforting...I don't have to chuck it and start from scratch. I'm fixing one of them now...and as I write the fix, the story is becoming deeper and more meaningful. I love it even more. And the fear of criticism has vanished completely. Criticism is not a negative. It's a positive. For me, it's a ladder to a better novel. My betas are building that ladder for me rung by rung. And I can't thank them enough. 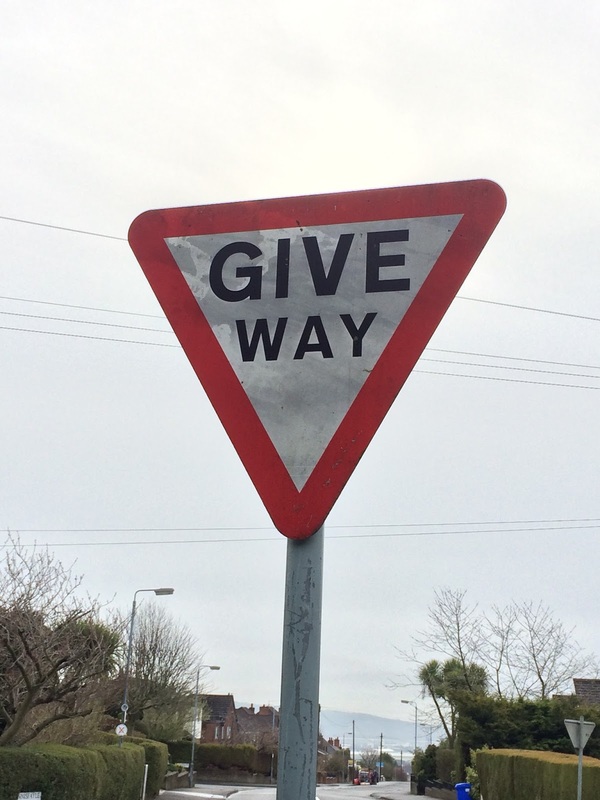 This is an Irish yield sign. 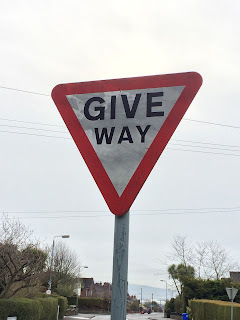 Give way is the perfect definition of the word yield. I need to give way to God’s will for my life. I need to wait until the way is clear. I must let go of my grand ideas and give way for His desires to become the desires of my heart. He promises in Psalm 37:4, Delight yourself in the Lord, and he will give you the desires of your heart. Do the desires of my heart align with the desires of His heart for me? I strive for that to be so. I have but one short allotment of time on this earth. May I always give way to what God desires for my life. Yesterday I met with one of my beta readers. She gave me valuable feedback about my manuscript. I appreciated the time she took to sit down with me and thoughtfully explain all of her answers to the 17 beta reader questions. As we worked through them, she came to the question that read: Did you notice any obvious, repeating grammatical, spelling, punctuation or capitalization errors? 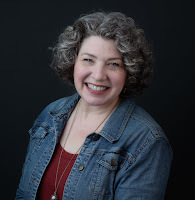 She pointed out that she wasn’t an expert on punctuation, but made an observation: “You didn’t use a single semicolon in your entire book.” Her eyes were filled with amazement, as if she’d never read anything so completely devoid of semicolons in her life. “I added one somewhere, but I’m not sure if I used it right,” she said. “See? They’re mysterious and confusing!” I sat back and folded my arms, satisfied to have justified my avoidance of the blasted punctuation symbol that confused and confounded me so completely. 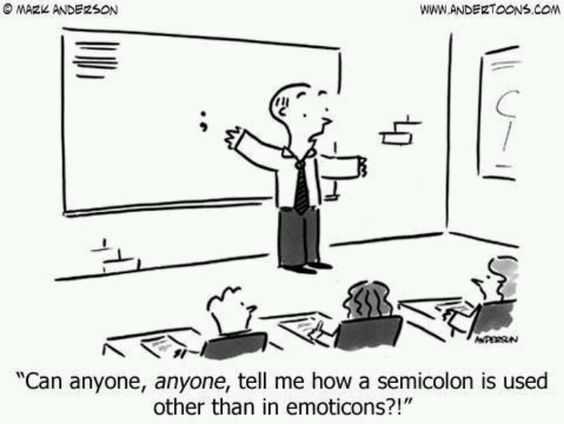 What is a semicolon, exactly? It’s not a colon. I know how to use a colon. It’s not a comma. I can handle a comma. It’s as if the colon and the comma had a baby and created the semicolon. Wikipedia defines it this way: semicolon or semi-colon (;) is a punctuation mark that separates major sentence elements. A semicolon can be used between two closely related independent clauses, provided they are not already joined by a coordinating conjunction. Here’s where my frustration lies. The definition begins with two ways of spelling the darn thing. Which one is right? Both? Fine. It separates major sentence elements…but doesn’t a comma also do that? Just like his momma, that semicolon. Then the definition goes on to say that it can be used between two closely related independent clauses provided they are not already joined by a conjunction. So there you have it. The semicolon is largely unnecessary. Conjunctions can connect clauses together and periods can allow for two separate thoughts even if they are similar. Aren’t varying sentence lengths appealing in writing? Aren’t they? My friend, agreeing with my arguments, but defensive of the semicolon due to the fact that her copyeditor added some to her manuscript, shook her head. “Maybe when you get to the copyediting stage, some semicolons will be added,” she offered. Perhaps, and that would be fine with me. I am of the opinion that only experts in the field of editing and semicolons should wield them. I’m suspicious of them. Isn’t everyone? They’re deceitful and sneaky. Who really knows where they go? Certainly not me! I'm relatively new to novel-writing. Granted, I've always loved to write, but writing a novel is something "real" writers do and calling myself a writer has been a struggle. It took three years to write my novel, to really, purposefully, create a story. I like my characters very much. I love them, actually. They're lovable, fun...but for a while they were very, very boring. I loved them so much, I didn't want any harm to come to them. That was a problem. For several months I found myself stuck. Stuck in the muck of why isn't this working? I had a map of where my story was going, I liked where it ended, but I was taking the long, comfortable safe route with potty stops and 5-star restaurant meals along the way. We all like to travel in style, am I right? So I remained stuck. No one grew and life was good…for my characters. Novel writing is a lot like mothering. If I protect my children from everything that might harm them, they live their lives in a cocoon. They don't try anything new because I'm afraid they might get hurt, or worse, get their precious feelings hurt. That's no way to parent. Kids grow through conflict. Kids flourish by doing. Kids learn through failure, pulling themselves up by their bootstraps and trying again. They discern whom they can trust by putting themselves out there and getting burned. They experience loss and discover ways to survive and heal. They drop into an unmarked pit and have to dig themselves out. A hovering parent produces a stagnant kid. A hovering writer produces a boring book. So, I kissed all of my characters on the head and told them I loved them. Then I dropped them into a deep, deep hole. Every single one of them was shocked and hurt. Their fears swirled around them and they searched for a way out. I had the luxury of knowing what came next...mostly. I left a couple of them in the hole a little longer than others, but as a mother, or a writer, I knew it was for their own good. It hurt me to see them like that, traumatized and afraid. 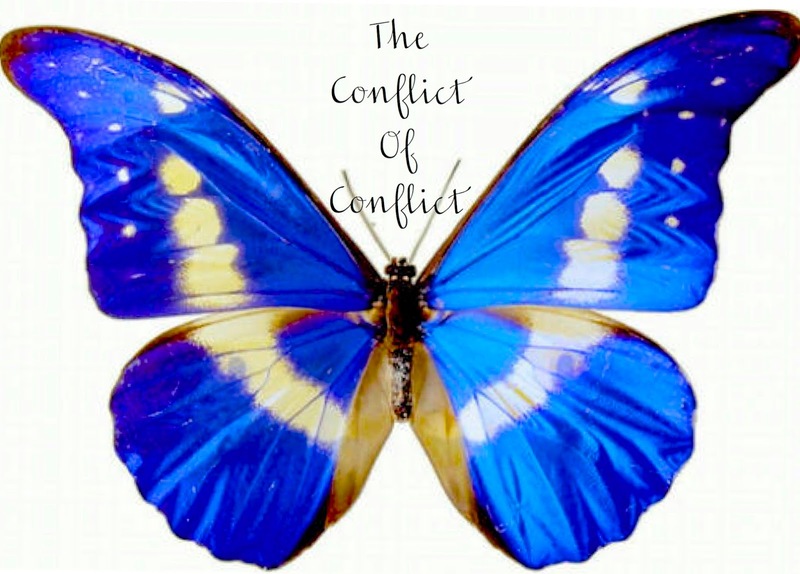 They suffered…but eventually they healed and they grew and their story was more interesting because conflict is inevitable. We've all experienced it. Everyone relates to it. And a story, a life without conflict is colorless and barren. This is my finished manuscript...well...the first draft. I'm no longer one of millions of people who say, "I'm writing a novel." I'm one of the few who can declare, "I wrote a novel." Where does it go from here? God only knows. And I've taken the next step. Six copies of this baby have gone to my beta readers. They're judging it as I type. They'll tell me if I have an ugly baby or a pretty baby or a baby that needs a little plastic surgery. I have no doubt that it will need a little grammarplasty or maybe a passivity-ectomy. One has already been returned to me. The feedback was good...very good actually. I'm quite encouraged. But along with the accolades, some suggestions...really good suggestions. So I've got work to do...and no doubt the other betas will have more fabulous critique to help my manuscript become polished and ready to present to agents. I'm done writing the story, but the work of the book will continue. But I'm not tired of the work yet. I'm not tired of reading my story, (I've read it at least 3279 times). I'm not tired of my characters. I want my story to go out into the world and make friends of my readers. I wait for my betas to return my manuscript and tell me if my baby was pretty, ugly or a little homely...hopefully nothing hours of editing can't fix. Ah, the comfort zone, that wonderful, glorified prison. I love being comfortable…coasting…dreaming. I can talk a big talk without risk, but putting feet to those dreams takes me to the edges of my comfort zone. I remember having a sleepover with a friend when I was in grade school. The fun activity we decided to do was to write a book. I wish I had saved that partially written book. I wrote three or four chapters. It was about babysitting and I remember that my protagonist was thrilled to have been offered one dollar an hour to babysit for the new neighbors. I also remember asking my mom to come upstairs to hear our progress. She patiently listened to 10-year-old sentences strung together with 5th grade panache. She said I had talent, a gift for writing. My 10-year-old self didn’t doubt that one day I’d write a book! It’s time I start doing the things I’ve had in my heart to do. Time to dust the cobwebs off those dreams I’ve tucked away behind the responsibilities and joys of motherhood. Time to be brave and exposed and vulnerable, and do the things I’ve always told myself I would do but haven’t had the guts (or is that faith?) to do.